Item Number: 410-1-04 12164 Actual Weight: 1 lb. Instant-bonding clear dots remove cleanly and easily. Acid-free. 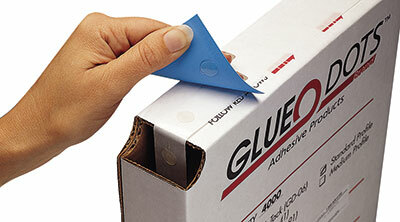 Convenient choice to attach samples, coupons, business cards, and reply cards to products. Packaged in a self-contained dispensing box. Low tack dots may discolor surfaces; test before using. Call for details about other thicknesses and sizes.